Happy Friday! After relaxing last weekend, it's been another busy week around here, with end of the school year activities, and still unpacking! Where does all this stuff come from? After next week, things should start slowing down here a bit, or at least for a short while! So excited, Katelyn graduates 6th grade next week! More to come! Today I am, seriously thrilled to share with you these perfectly sweet and super soft cookies, that explode with bursts of fresh fruit flavor in your mouth. My husband was asking for something sweet again, and I was planning a chocolate cake for Katelyn's graduation party, so, I was thinking, something with lemon, something with key lime, or something pina/colada-ish! I came up with blank, nada, zilch, nothing! That is until I saw these on Flickr. These can be made really quickly with store bought Sugar cookie dough, frosting, and really any type of fruit you prefer! For red, white and blue, I used strawberries, and blueberries. I just made a batch of my favorite sugar cookie dough, and cream cheese frosting. It is the perfect sweet treat for any upcoming special event! When it comes to rolling out the dough, a few things might surprise you. One, I prefer to work in small batches, and by small batches, enough to make 6 cookies. Why? AND finally, it's a perfect size for Lindsay to work with. 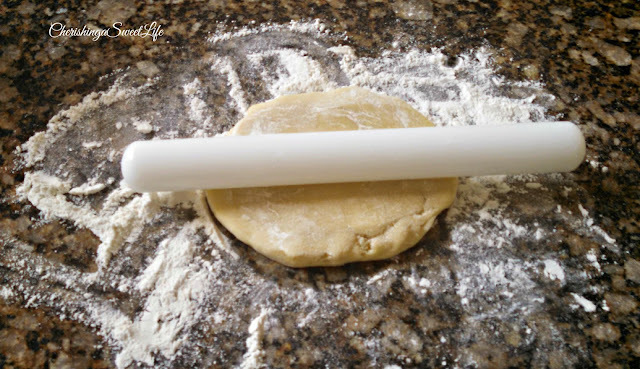 I give her my fondant roller, and show her how to roll them out, by flipping and rotating the dough; makes it easier for her to work with. LIFE HACK 101, why I didn't think of this sooner! With all the unpacking, I found unbelievably ALMOST all of my baking tools, except for one! You guessed it, my 2-inch round cookie cutter! Have no idea, where it is!! Has this ever happened to you?? I remember watching a cooking show, sorry I don't remember which one, I think it was Guy Fieri, and he was making biscuits, and using a Rocks glass to cut them out. So I looked through all my glasses, (I have a rocks glass, but I have small hands, and it just didn't feel comfortable), then I found this plastic glass worked perfectly! And then we were on a roll, me and Lindsay cutting cookies out, taking turns frosting and garnishing the cookies! This turned out to be a fun cookie decorating night! 1.Preheat over to 350 degrees Fahrenheit. 2.Cream butter and sugar for in a stand up mixer. Scrape down the sides of the mixing bowl. Then add the egg and beat until just blended. Again, scrape down the sides of the mixing bowl, and add the vanilla, and beat until well blended. 3.In large bowl stir together flour and baking powder; add alternatively with heavy cream to butter mixture, beating until well blended. 4. Gather dough into one large ball, and refrigerate for 1 hour. Lightly flour surface and rolling pin. Working in small batches; keeping remaining dough in refrigerator, roll dough out to 1/2 inch thick. 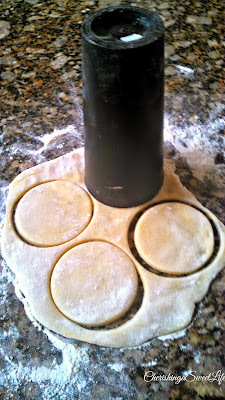 Using a 2-in round cutter, cut cookies out! 5 .Bake 8 minutes or until edges are lightly browned and cookies are set. 6.Remove from oven, and transfer cookies off the cookie sheet to a wire rack. Cool completely. 7. 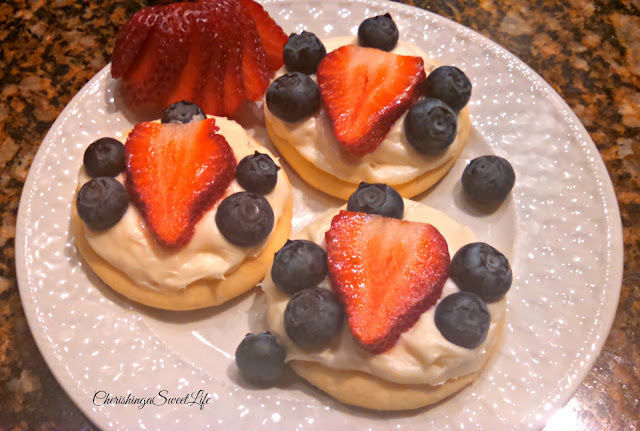 Frost and garnish cookies with fresh fruit of choice! As always, I saved a couple cookies, especially for you! I always use a glass for round cookies, because I've never found a perfect size cookie cutter. I love that Lindsay is such a help in the kitchen. I bet she loves getting to make cookies with you! Lately, I've been making different recipes with strawberries on my kitchenhospitality.com blog. This week I changed to a blueberry recipe. This is a great idea of combining both. Love it. Love the toppings..must be a perfect mixture with all those fresh fruits..
Wow Christine, you made a simply sugar cookie look delicious ad theres nothing better than a soft cookie!! This will be great with OMHGWW this week, Thanks so much for hosting again this month!!! Cant wait to hear about your new home too!! What a great cookie for the upcoming holiday celebrations! Hope you are having a great day and thanks so much for sharing with Full Plate Thursday this week. How can cookies be bad for you when they have fruit on them? These look yummy! Thank you for visiting #AnythingGoes. I love the taste of fresh blueberries and cream cheese! Great use of berries. Looks delicious. Thanks for co-hosting WW. Looks like a party in your mouth! 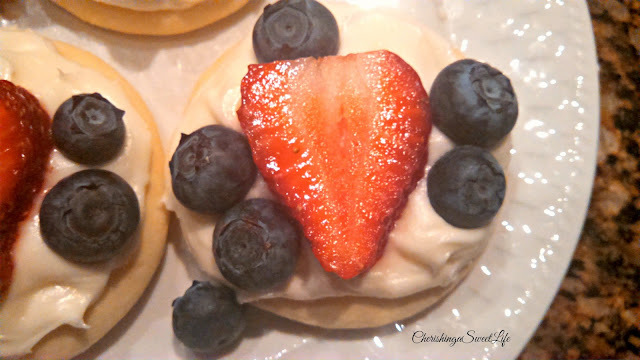 Thanks for Co-Hosting the Oh My Heartsie Girl Wordless Wednesday! I look forward to seeing you again next week! I love cookies and these look amazing. I can't wait to get started on this recipe. Thanks for co-hosting Oh My Heartsie Girl WW. See you next week. These look perfect for summer BBQ's! Thank you so much for sharing with us at Brag About It! Wow, these look delicious! Perfect for 4th of July! I love baking anything that includes berried too! These cookies have summer written all over them! Berries and cookies....yum! These are making my mouth water! I love sugar cookies and fruit. Anything with strawberries, blueberries and cream cheese is for sure great! Thanks for linking up and sharing with us at Funtastic Friday. Hope you join us again this week. What a great holiday treat! My kid's would love helping to make these. Thanks for sharing and happy to be co-hosting WW with you!